As our new Mirage IV finally arrived inside the Museum grounds, our team were able to take a short breath before the task of assembling the aircraft began. Across the Museum’s social media channels, thousands of our supporters were able to follow the Mirage progress from loading in France, across the water and northwards to Elvington. We were asked by several people exactly how we were able to cover the whole process through social media, so here is a short article that tells everyone how we did it, who was behind the coverage and also some of the tools we use to bring these stories to our supporters and visitors. The Museum is very much aware of how important modern social media and video is in recording and telling some of the interesting stories and historical events that happen here at Elvington. The latest process started around 12 months ago when we overhauled our social media channels to try and develop ways to reach more of our visitors and bring them interesting news. Sometimes this is in real time, such as the loading of the Mirage in France and also the arrival at the Museum. Other times we use it to alert visitors in advance of things they might enjoy seeing when they visit. It is also a useful way of including those supporters from overseas who aren’t always able to be with us. The Social Media Team comprises Neill Watson, of Winward Media. He is joined by son and cameraman Adam Watson on significant events to create short films that allow people around the world to see the Museum’s ongoing work. The Team is part of the wider Museum Communications Group led by Director, Ian Reed and includes PR Manager Ian Richardson. Their combined marketing and historical knowledge spanning decades, provides creative and imaginative content often linked with anniversaries as well as personal and scientific achievements within aviation. “The Museum is packed full of interesting things to talk about in so many different ways” says Neill. “Today’s social media channels can be a hungry mouth to feed, but here we have so many different subjects we can talk about to give visitors flavour of things to do when they spend time here.” The fact that the Museum’s visitors are wide and varied is also something to consider. “The majority of Museum visitors are families looking for an interesting day out. This means that we had to be able to explain the significance of the Mirage IV to a wide range of people who may in fact know very little about it.” Says Neill. Following a project such as this takes quite a bit of logistical planning. Here’s an overview of some of the elements that the team brought together to help all of our visitors and followers enjoy the event. “For the Mirage project, we decided to capture as much footage and photography as possible. The event had been more than a decade in the making and would never be repeated. We knew that long after the event had faded from public awareness, we could continue to create interesting ideas around it as long as we were there to capture the move as it happened. Monday was a long and busy day as Director Ian Reed talked to multiple TV, radio and press news outlets with translation assistance from Sandrine Bauchet, whilst Heritage Co-ordinator, Gary Hancock worked on loading. We were kept busy trying to capture as many angles as possible while battling with overseas 4G and data roaming. 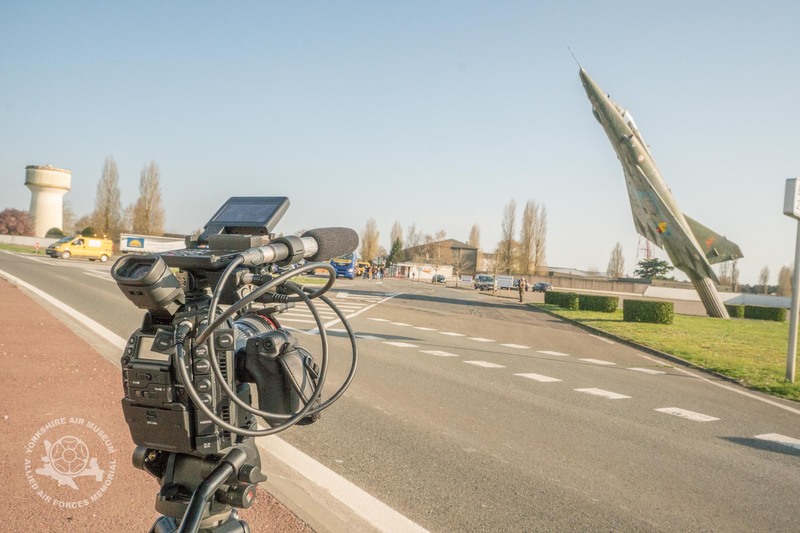 An afternoon broadcast on Facebook Live from inside the secure airbase of Chateaudun in France was a first for us. Our plan was to follow the main truck convoy after the loading, and capture it moving across France and being shipped at Le Have before sprinting ahead to Portsmouth and then to be at the Museum for their arrival. Whilst it was more difficult and tiring to follow the convoy across France, it did make for some unrepeatable opportunities to share the journey across social media. Brittany Ferries were superb in allowing us access to the loading deck of the ferry as the trucks arrived at Le Havre, meaning we could broadcast live on Facebook as the Mirage was loaded onto the ferry. The following day, we sprinted north, all the while hearing the dramas unfolding behind us as our French drivers battled bureaucracy with VOSA. Eventually, in the twilight of Thursday evening, the tired drivers arrived at Elvington as we again streamed live on Facebook long after Museum closing time, thus allowing our followers a chance to see something that would not normally have been possible. For the photography enthusiasts and technical people out there, here’s a very brief overview of the equipment and systems we used to tell everyone what was happening throughout the Mirage move and also the ongoing events around the Museum. Main filming camera. Our main camera for this was the superb and powerful Canon C300 MK2. A 4K UHD broadcast quality camera, the C300 fits with our existing lenses such as the Canon 17-40 f4 and our favourite Canon 70-200 f2.8 IS telephoto zoom. The C300 is designed to give a ‘cinematic’ look to video and has proved to be hugely powerful and versatile, without being so big that it becomes a hindrance. It is certainly a camera you will see being used more and more as we expand the film content around the Museum. This is accompanied, or course, by the usual array of seemingly essential support kit such as tripods, rigs and external hard drives. Daily camera. – After more than ten years of shooting with Canon 1DS cameras, I moved to a Sony A6300 mirrorless camera last year. As more and more of my work was fast moving and needing to carry a camera capable of shooting high resolution for press, video for social media and also being small enough to carry almost all the time. The Sony has worked superbly and is the camera we used to shoot the Nimrod Thunder Day on board with. It is accompanied by two lenses, a 10-15 wide angle and the 24-105 short telephoto, plus we record sound using the Rode Video Mic. iPhone – probably the most popular camera in the world today, our iPhone 6 is about to be swapped for the newer iPhone 7. We also have the Rode Smart Lan mic and Rode app for recording interviews.